Be the first to share your favorite memory, photo or story of Gale "Buck". This memorial page is dedicated for family, friends and future generations to celebrate the life of their loved one. Gale "Buck" A. Shelton, age 92 of Wellsville, KS passed away Sunday, October 28, 2018 at the Wellsville Retirement Community. Funeral services will be 10AM, Saturday, November 3, 2018 at the Wellsville Baptist Church. Visitation will be 5-8PM, Friday evening at Wilson's Funeral Home. Interment will follow services in the Wellsville Cemetery. Memorial contributions may be made to the American Legion Post 194 or the Alzheimer's Association in care of Wilson's, PO Box 486, Wellsville, KS 66092. Gale Arthur Shelton was born March 22, 1926 in Centerville, Kansas, the son of Arthur Emmett and Blanch Gertrude (Howard) Shelton. 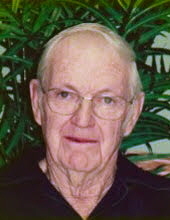 He attended school in Parker, Kansas and received his high school diploma from Parker High School in May of 1945, although he was drafted into the US Army on March 22, 1945 to serve his country during WWII. While on active duty, he served as a Storekeeper/Supply Specialist stationed in the Asiatic Pacific/Hawaii. Upon on his honorable discharge on November 26, 1946, he was awarded the Asiatic Pacific Campaign Medal and World War II Victory Medal. He continued serving his country by enlisting in the Army Reserves as a Food Service Specialist preparing huge meals for hungry soldiers until November 19, 1961, leaving the service with the rank of Master Sergeant. On July 5, 1947, he married the love of his life, Doris Joan Gordon in Osawatomie, Kansas. They were married 64 years before her passing in 2012. This union was blessed with 6 children. Gale worked in the Texaco oilfields in South Central and Northwest Kansas until they settled in Franklin County to farm in the late 1950's. Gale was a farmer at heart and loved harvesting crops as well as caring for livestock. After retiring from farming, Gale worked for Water District 1, the Wellsville Manor, (Wellsville Retirement Community) in maintenance and had a handyman business. Gale stayed active in the community by volunteering his time and talents. He was well known for his homemade pies, pancakes for New Hope fundraisers and helping prepare meals for charitable fundraising events. Gale was a member of the New Hope Baptist Church, the Wellsville American Legion Post 194, Eastern Star (where he earned his 60 year pin), the Gardner Masonic Lodge #65, (where he was awarded his 65 year service pin), 40 & 8 and the VFW Post 5901. He is survived by his children: Judy (John) Mickelson of San Pedro, CA; Gale (Edie) Shelton, Jr. of Oklahoma City, OK; Janet Akins of Hutchinson, KS; Jane Shelton of Topeka, KS; Steve (Jennifer Crosby) Shelton of Raytown, MO; his adopted son, Michael Shelton of Little Rock, AR; a sister, Louise Ratliff of Ottawa, KS; 14 grandchildren; 4 step-grandchildren; 16 great-grandchildren; 10 step great-grandchildren; and many other family members and friends. He is preceded in death by his parents; his wife; an infant daughter, Shirley Ann; sisters, Leah and Helen and 2 infant granddaughters, Tina and Ashley Daniels. To send flowers or a remembrance gift to the family of Gale "Buck" Arthur Shelton, please visit our Tribute Store. "Email Address" would like to share the life celebration of Gale "Buck" Arthur Shelton. Click on the "link" to go to share a favorite memory or leave a condolence message for the family.